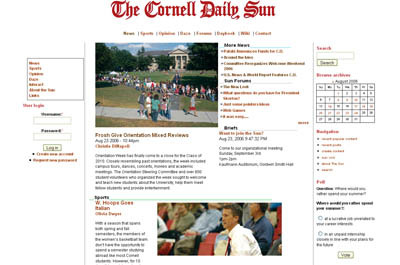 The Cornell Daily Sun redesigned their website last night, in what amounts to be a huge leap forward in terms of both form and function. Even so, there is a lot of room for improvement, and hopefully the Sun will continue to improve their site. In particular, the formatting on many of the pages is still off. Stories are posted with the wrong date on them (for instance, today’s stories are dated as if they were published yesterday). And the site is loading at a deathly pace this morning. Moreover, the archives appear to be incomplete. For instance, if one came across the Village Voice article where a review I wrote for the Sun was quoted, you would be hard pressed to be able to find my article currently up on the Sun’s website. As a frequent alumni reader who tries to scan the news daily and keep current on topics, I have to say that the new design is completely user unfriendly. Sadly, I think the Daily Sun may now drop from my lists of sites I regularly visit. Here’s to hoping that the Sun continues to improve its public webpage as the semester progresses and before the busy prelim season starts. 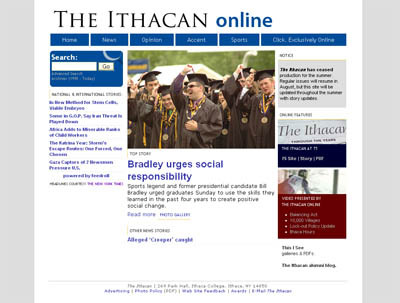 Given that Cornell has some of the best computer science, information technology, and art and design students in the country; it is unfortunate that the Cornell community had to suffer through the much maligned summer-design.